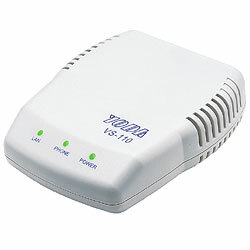 VS-110 is cost-effective VoIP Telephone adaptor for SOHO users. It is powered by a SoC, 16-bit DSP, 32-bit RISC CPU with 125 MHz clock rate. Supporting RFC3261, RFC2543 SIP protocol makes it easy compatible with different SIP proxy and VoIP devices in the market. Rich features and all configuration and setting by telephone key pad, VS110 does attract tons of demand ever since its formal release.